In modern day England, a man returns to his hometown in order to attend a funeral. Instead of attending the luncheon after the service, he ventures down the lane of his first home and his memories of Lettie Hempstock and their experiences together. A nickel’s worth of free advice to any who has not yet read this book. Wait for a cold, dreary day – curl up in a giant chair with a soft blanket and a cup of tea and read this in one sitting. Bribe your children to stay away, send your husband to the pub to watch sports, whatever it takes. This book is very short and, trust me, getting interrupted will SERIOUSLY irritate you. Now on to the review. 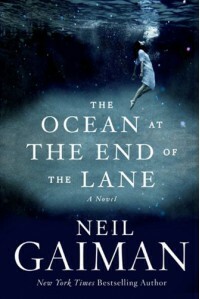 How do I love Neil Gaiman? Let me count the ways . . . I love that he can write something that COULD be terrifying, yet somehow stays riiiiiiiiight on the edge. I love that all of his stories read like haunting bedtime tales for adults. I love his beautiful imagery. I love that everything that he writes is so SMART. I love that you can read 5 pages and know it’s Neil Gaiman without even seeing the byline. I love that he puts his soul into his work after all this time and doesn’t just produce crap in order to get a paycheck. 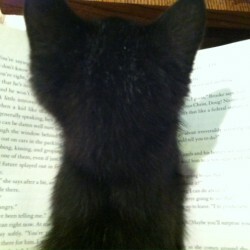 I love that this book had a unique little kitten as a character.